Free shipping within New Zealand until further notice. Have you ever wonder what is inside Mr.P body? The truth has been revealed! The designer's tragic missing teeth becomes the funniest salt and pepper shaker. 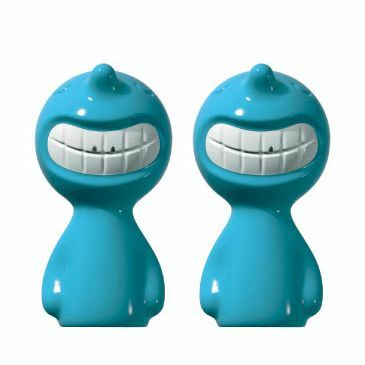 Mr.P Brother Shaker, the smiley face salt and pepper shaker will make you laugh. He smiles so wide until you see his missing teeth. Guys, it's time to fill your dining table with fun and cheeky style by Mr.P. Choose products and add to basket. Fill in required information and press Send. If you prefer pick-up, select pick-up at Delivery. zucker online will send you confirmation via e-mail automatically. We accept bank deposit, credit card and PayPal. Please read the instruction on final screen or in the email and make payment. We usually ship the items on the day after we confirm payment. Courier will be NZpost. Wait for a couple of days. Goods will not be shipped until payment has cleared. If you want to come to our place to pick up your order, please inform the time and date you come by e-mail. The place we meet will be Tawa, Wellington. We accept cash(exact amount, please) on pick-up. We have NO EFTPOS. (shipping)We do not charge shipping fee inside any place in New Zealand unless mentioned in product description. (outside NZ)Shipping cost sending oversea outside New Zealand will be advised once you make order. In this case, you can cancel if the cost does not suit you. (Cancellation)We do not accept cancellation after we confirm your order by e-mail. If you find any mistakes, please inform as soon as possible. (return)Please accept our no refund policy. In case you find defective goods or shipment error, please inform within 5 days after you receive the goods.